Curator’s note: This is the second of five blog posts made by students in Dr. Perks’s spring 2015 Media Marathoning class at Nazareth College. Students conducted qualitative research projects in groups addressing one research question. These blog posts represent their distillation of findings that are also reported in 8-10 page essays. This post is from Elizabeth, Chase, Cole, and Enzo. The development of media marathoning habits is driven by viewers’ desire for control over television engagement, but leads to a loss of control of their ability to restrain their viewing habits when confronted with new texts. Viewers most clearly demonstrate this control through the use of stockpiling; as Perks (2015) defines it, this is the practice of saving up of a television series (p.xxix). Stockpiling allows viewers to watch shows at their own convenience, and avoid the suspense of cliffhangers. Instead of watching TV shows live, Anastasia elected to stockpile shows and stream them on Netflix. Stockpiling allows viewers to exercise control over their media marathoning habits, and integrate it into their schedule at optimally convenient times. Stockpiling also allows viewers to avoid waiting for cliffhanger resolution until the next TV episode is broadcast; viewers simply don’t have the patience to wait that long. Interviewee Sam expressed this impatience: “I just don’t ever wanna watch an episode and then wait a week for the next one.” Sam also stockpiled and streamed on Netflix. By stockpiling and marathoning, viewers have the option to immediately watch the next episode, and avoid the suspense of cliffhangers. 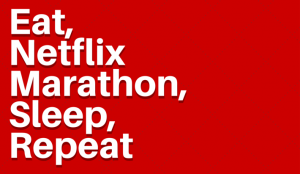 The appeal of developing media marathoning habits is partially rooted in the ability to stockpile television shows, and thus control when and how the show is consumed.